With the forthcoming summit -- the first after a membership expansion to include India and Pakistan last year, the Shanghai Cooperation Organization (SCO) is set to play a more influential and substantial role in promoting regional security, peace and prosperity. The key diplomatic event, which runs from June 9 to 10 in east China's coastal city of Qingdao, occurs at a time when the world is in need of concerted action to address challenges and threats ranging from regional conflicts to spreading terrorism, from populism to unilateralism, and must advance economic globalization and improve global governance to benefit all. Established in Shanghai in 2001, the SCO has developed into a comprehensive regional organization, which actively plays a constructive role in regional and international affairs. The SCO accounts for over 60 percent of the Eurasian landmass, nearly half of the world's population and over 20 percent of global GDP. The most populous regional organization has eight member states: China, India, Kazakhstan, Kyrgyzstan, Pakistan, Russia, Tajikistan and Uzbekistan, as well as four observer states and six dialogue partners. Member states have steadily carried out fruitful institutional cooperation in fields such as security, economy and people-to-people exchanges, with a number of important documents adopted. The "Shanghai Spirit" of mutual trust, mutual benefit, equality, consultation, respect for diverse civilizations and pursuit of common development, stated in the SCO Charter, has been consistently upheld by all members to pursue pragmatic cooperation. In security, a work priority of the SCO, anti-terrorism cooperation among member states has been strengthened in recent years, said Yevgeniy Sysoyev, director of the Executive Committee of the SCO Regional Anti-Terrorist Structure (RATS), a Tashkent-based permanent body of the organization. From 2013 to 2017, institutions of SCO members foiled more than 600 terrorist crimes and captured 2,000 members of international terrorist groups, he told Xinhua, adding that the RATS has become an effective component of the regional security system. Numerous bilateral and multilateral anti-terror drills have been organized within the SCO. In December, the first such drill attended by the eight members was held in southeast China's coastal city of Xiamen, to improve coordination and share experience on fighting cyber-terrorism. After the accession of India and Pakistan, meetings of defense ministers and foreign ministers, respectively, from SCO members were held in China this year to implement consensus reached at previous summits and prepare for the upcoming summit. Progress has also been made in pushing trade facilitation, cooperation in environmental protection, justice, technology and other fields, through a number of meetings since the 17th SCO summit in Astana in June last year. Meanwhile, people-to-people exchanges broke new ground as the first SCO People's Forum, held in April in northwest China's Xi'an City, proposed that governments and NGOs carry out various exchange activities with the theme of building a community with a shared future for humanity. China also hosted the first SCO women's forum, political parties forum and media summit in May and early June. SCO cooperation has brought benefits to people of member countries and contributed to regional peace, stability and security. The organization will unleash new potential for cooperation and exert greater influence in the future. The Qingdao summit is expected to ratify a five-year outline for the implementation of the "Treaty on Long-term Good Neighborliness, Friendship and Cooperation," and a three-year outline for cooperation on combating terrorism, separatism and extremism. With joint efforts from all sides, the summit will be a significant meeting, setting future directions and goals and creating a milestone in the history of the SCO. The SCO summit comes after the Boao Forum for Asia annual conference in south China's Hainan Province in April. In a keynote speech at the conference, Chinese President Xi Jinping announced a slew of new opening-up measures. The year 2018 marks the 40th anniversary of China's reform and opening-up, which have brought immense economic growth to the country. Two other major global events China will host later this year are the Forum on China-Africa Cooperation summit in Beijing in September and the first China International Import Expo in Shanghai in November. The events will showcase the "major-country diplomacy with Chinese characteristics" and China's opening-up drive. China has advocated for "a community with a shared future for humanity" and a new type of international relations featuring mutual respect, fairness and justice, and win-win cooperation, and its Belt and Road Initiative (BRI), a "project of the century," has won wide support worldwide. The initiative, or the Silk Road Economic Belt and the 21st Century Maritime Silk Road, proposed by China in 2013, has become a key platform for creating a community with a shared future for humanity. "The SCO and BRI offer mutual support and opportunities to each other, and the BRI concept has already been embedded into the SCO and is making positive progress," said Li Jianmin, a researcher with the Chinese Academy of Social Sciences (CASS). "Firmly committed to the Shanghai Spirit, SCO member states are making solid progress on the road of building a community of shared future, thus establishing a fine example of the new type of international relations featuring win-win cooperation," said Xi in his speech delivered at the 17th SCO summit last year. According to SCO Secretary-General Rashid Alimov, a community with a shared future for humanity represents a global perspective embedded in China's upholding of justice while pursuing shared interests, and shows China's pursuit of peaceful development. "Qingdao is modern, international and has rich historical sites," said Junusbekova Meruyert, a student from Kazakhstan in her fourth year at China University of Petroleum in Qingdao. Meruyert said she would return to her own country after graduation and open an education center to help those who plan to study in China. "Besides trade and economic cooperation, I expect more cultural and education exchanges between China and Kazakhstan," she said. 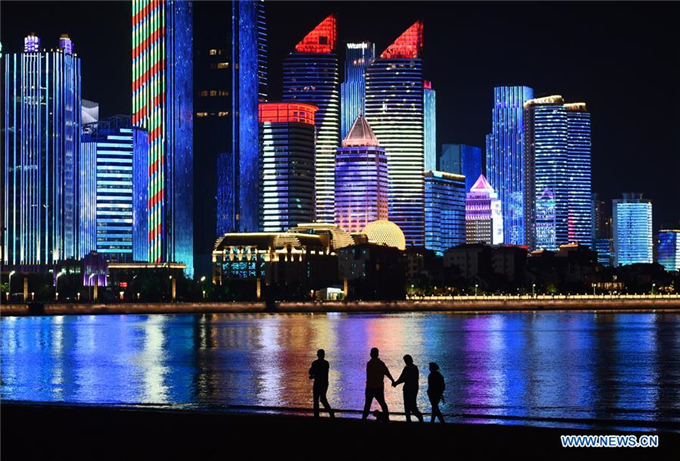 Qingdao will also witness the SCO embark on a new journey featuring more effective and extensive cooperation while its member states remain true to the "Shanghai Spirit." A major port and production base for both high-speed trains and home appliances, the dynamic city is eyeing closer cooperation with SCO countries as China opens wider to the world. In April, China's Ministry of Commerce decided to support Qingdao in building the country's first demonstration area for China-SCO regional trade and economic cooperation. The demonstration area is located in the Eurasian Economic and Trade Industrial Park, initiated by Qingdao and the Business Council of the SCO in 2015. The industrial park has attracted 21 projects with a total investment of 18 billion yuan (2.8 billion U.S. dollars). Last year, the trade volume between Qingdao and SCO member states hit 4.6 billion dollars, up 9.8 percent year on year. The city's imports from SCO member states jumped 41 percent to reach 1.46 billion dollars. Haier Group, the world's leading home appliance manufacturer based in Qingdao, has factories in SCO countries such as Russia, India and Pakistan. In 2017, trade between China and other SCO member countries totaled 217.6 billion dollars, up 19 percent year on year, according to China's Ministry of Commerce. Starting in Qingdao, the SCO will usher in a new phase of cooperation and development, become more influential and dynamic, and play a more active role in building a community with a shared future for humanity. "The upcoming SCO summit in Qingdao will be a milestone of historical significance," Alimov told reporters at the SCO headquarters in Beijing on Sunday. "Since taking over the rotating presidency of the SCO a year ago, China has made enormous efforts to push practical cooperation in various fields to achieve significant progress. The Qingdao summit is expected to be the one with most plentiful outcomes in the SCO history," said Sun Zhuangzhi, a researcher in SCO studies with the CASS.